Essential Bar-Restaurant POS functions: orders, warehouse management, cash management, reporting. SellWell is a point of sale system for bar or restaurant. This is a completely standalone solution. You do not need a back office. It does not require the Internet connection to work. All data are located on your device. With this POS, you can set up your goods, taxes (VAT, GST, TVA, НДС etc. ), methods of payment, users, tables, and discounts directly on your iPhone or iPad. POS tracks the work shifts and days. At the end of day, the application sends reports by email (if configured). The application keeps orders data from all previous days and shifts. POS allows tracking the remaining quantities of goods on stock. 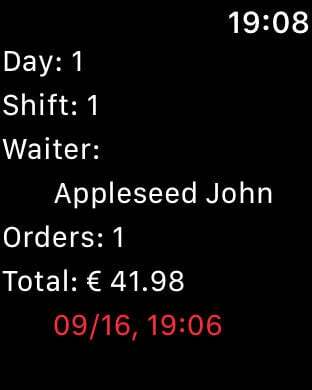 The Apple Watch App may be used as a short-look orders monitor. 1. Configure goods, taxes, departments, methods of payments (Cash, Credit cards etc. ), discounts, users and tables. 2. Define settings: taxation type (tax-exclusive, tax-inclusive, no taxes), currency symbol, switch on/off stock control, switch on/off user authorisation, define email for reports sent at the end of day, and choose a camera to scan barcodes. 3. If the stock control option is switched on (see above), take inventory of your goods. - Printing of item label with description, price etc. The sales occur in shifts. - Use the Receiving function to increase the quantities on stock. - Use the Shipping function for cases when you need to decrease the quantity on stock. - Set the actual available quantity of stored items manually by taking inventory with the Inventory function.